Children who are in preschool or are just starting to become students are in a rapid phase of development. For these kids, play is about a lot more than just fun. It’s also an important way to become independent and to help with physical, cognitive, emotional and physical development. Inclusiveness. PlayPower Canada can help you set up an inclusive play space that is not only accessible for children with mobility issues but that helps children of different ages, abilities and skills play together. A chance for physical activity. Children in school spend many hours sitting at a desk, and inactivity is a key concern for parents and educators. Playground equipment encourages children to get active and to see exercise as fun. A chance for social skills building. Children in school spend a lot of time developing friendships and peer groups. Play spaces offer neutral ground where children can meet other kids and develop lasting friendships. Learning opportunities. Our outdoor play equipment is designed to reinforce the learning that happens in the classroom, with panels and activities that are instructional as well as fun. Options for expanding the imagination. Play time lets kids imagine and work on their creativity with freeform fun that pushes them to let their own ideas run wild. Durable and safe playground equipment. At PlayPower Canada, we take safety and quality seriously. All our school playground equipment for Canada meets and exceeds safety standards and is made from quality materials, so it lasts. All our playground equipment is designed with input from engineers and child experts and is carefully tested for safety and longevity, even during Canadian winters. High quality. Made from durable materials, our playground equipment is designed with attention to detail, ensuring years of use. Preschool kids can be very enthusiastic during play, which is why our equipment is extra-rugged to handle lots of activity. Safety. Preschoolers have different motor skills when compared to older kids, and our preschool equipment is designed to keep them safe. Lower equipment, rounded edges and other details help minimize the risk of injury. Imaginative play. Themes, bright colors, textures and other details of our play equipment engage all of a child’s senses, encouraging them to dream big. Age-appropriate development opportunities. Our playground equipment is designed to help preschool children develop motor skills, including fine motor skills, while also offering opportunities for social, cognitive, emotional and physical development. Kids learn shapes, numbers and how to play together while they play on our equipment. 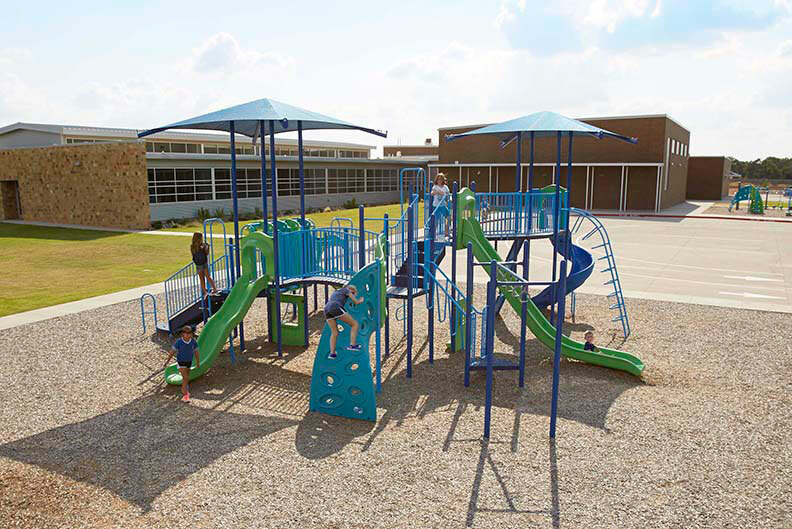 If you’ve been researching school playground manufacturers and trying to find the best solutions, we offer customized, one-on-one help, helping you build the playground you want. Contact us today for a free consultation or request a quote for specific pricing.